The news of the day in Cricut Land was an announcement about a new edition of the Cricut Cake machine. The Cricut Cake Martha Stewart Crafts Edition will be debuting on HSN on July 19th. Here is a LINK to the full press release. The image at the top of this post is from the Elegant Cake Art cartridge handbook. In addition to the machine, there will be three new Martha Stewart Crafts Cake cartridges. (You can click on the image to enlarge it). 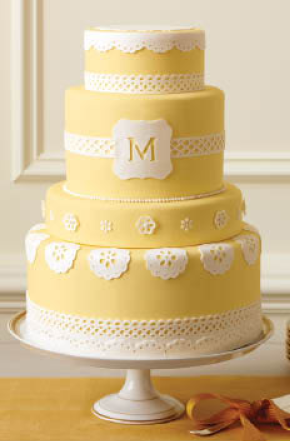 Here is the sample sheet for Martha Stewart Crafts Elegant Cake Art from the Cricut.com Cartridge Library. You can download the full handbook HERE. 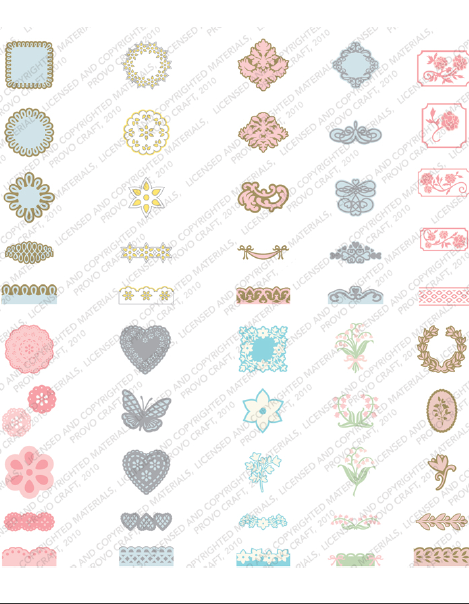 This is the sample sheet for the Martha Stewart Crafts All Occasions Cake Art cartridge. The third cartridge is the Martha Stewart Crafts Seasonal Cake Art cartridge - here is the sample sheet. Joy at Obsessed With Scrapbooking and Melanie at Courtney Lane Designs will each be giving away a set of the new Martha Stewart cartridges. The cartridges will work in any Cricut machine so even if you aren't a "cake person" you will probably want to have these for other projects! (I know I do - I just can't get enough Martha!). 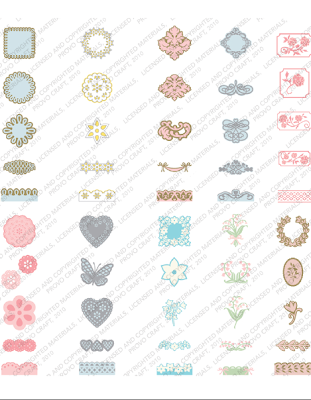 If you already use Martha Stewart punches you will recognize many of the designs - now you will be able to cut them in any size you want! The Handbook for the Toy Story cartridge has also been added to the cartridge library and you can download it HERE. 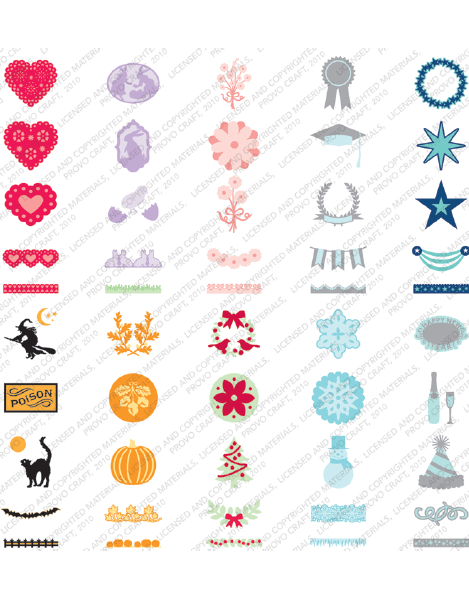 The Cartridge Library on the Cricut.com site is a great resource. If you are not familiar with it, click HERE to go to the listing of all of the Cricut cartridges with PDFs of the sample sheets and cartridge handbooks. This is the best way to decide which cartridges you want to add to your wish list (if it is like my list it is growing faster than ever!). I'll be back with a few more posts tomorrow. It is Hello Thursday (3rd Thursday) and there will be some more new cartridges announced. It is also Sweet Treat Thursday on the Cuttlebug Challenge Blogspot and you will see the Back to School Projects the Cricut Design Team created this week. This definitely has the blogs a buzzin'...exciting news. Thanks for the preview pics. Martha has done a fabulous job with her new cartridges. I would like to use these for card making. That's exciting news. Thanks for always keeping me in the loop! I do like Martha's punches so having them in a cartridge will be great! These are GORGEOUS, but I wouldn't expect anything less from Martha Stewart. How exciting! Those cartridges will be great for both Cake and paper crafts!! Cricut has really done themselves right now, teaming up with Martha Stewart. Holy Moly!!! 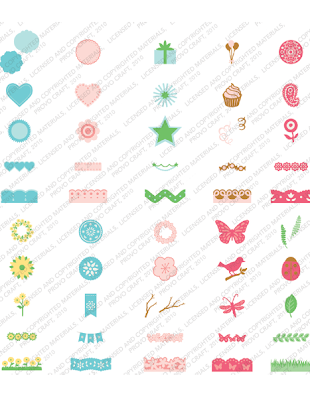 I am IN LOVE....with all the new Martha Stewart/Provo Craft Cricut cartridges coming out. I'm not into making cakes but I see real potential for my scrapbook pages!!! WOW...you are full of info today. Thanks! It is interesting to note how different the Martha carts look from anything PC has put out in a long time. I wouldn't have thought they would be so noticeable. I like anything Martha puts out for scrapping. Her products are first class.